This afternoon the Austin City Council moved unanimously to approve Item 16 on the agenda, the purchasing power agreement with Gemini Solar Development Company to build a 30 MW solar plant at the Webberville tract. That means that by the end of 2011, Austin should be the proud home of the nation’s largest utility scale photovoltaic installation. This is a tremendous milestone for both the City and Austin Energy that will set us up as a leader in solar energy, create jobs, attract industry, and protect our citizens from volatile future energy prices while curbing our global warming emissions. Lee Leffingwell made the motion to approve item 16 with three additional recommendations. The first direction was to include a provision that any federal stimulus funds, rebates, or incentives recovered would be passed on to Austin, rather than kept by Gemini. The second was to create a new task force to review future energy projects. The task force, he promised, would consist of diverse stakeholders and not be weighted in terms of energy usage. This is an important point, as several representatives from the city’s large scale industrial users such as Spansion and the Building Owners and Managers Association (BOMA) specifically requested that future stakeholder meetings be based upon the size of user consumption– meaning that in future energy projects, city council dialogue would be dominated even more than ever by large industrials. As David Power, Public Citizen’s Deputy Director, testified, that sounds a little too much like, “for every dollar I spend, I get a vote.” Cheers to Lee Leffingwell for insisting on a more inclusive process. The third and final additional direction was, as expected, to roll the power purchase agreement into Green Choice, so that citizens would be able to voluntarily opt into a program to buy solar power at a locked-in price. Councilman Mike Martinez stated that he would be more than happy to be the first person to sign up for such a program, except that Leffingwell already called “shotgun” on that distinction. Council members Sheryl Cole, Laura Morrison, and Randi Shade all made additional comments in support of the plant, stating that this was a tough decision to make in hard economic times but that this solar plant, far from a luxury item, was an important element of Austin’s long term energy goals. 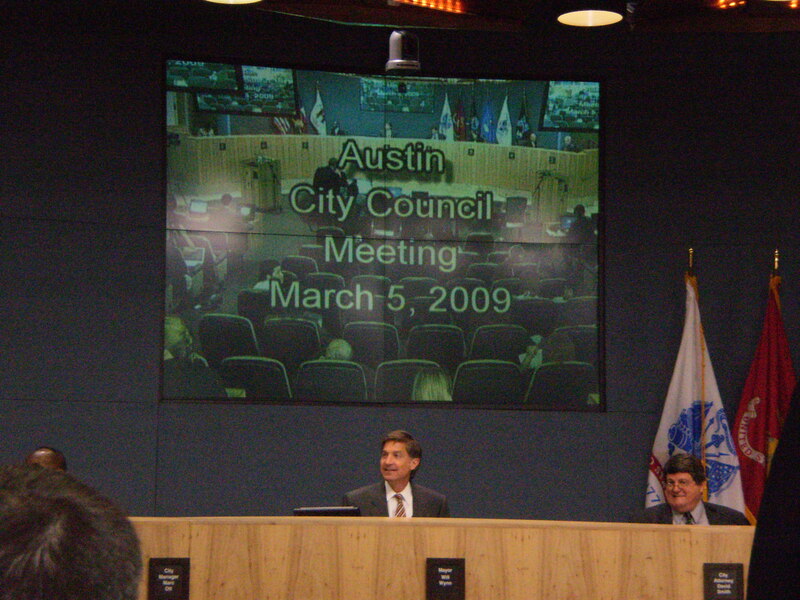 The Austin City Council has earned Public Citizen’s most heartfelt appreciation for proving itself, once again, a renewable energy leader. We especially respect the time and effort that the Council and its staff put into this contentious process, and look forward to working with them on future projects. We also encourage Austinites to express their thanks to the Mayor and City Council for approving this historic first step towards our renewable energy future. As expected, the Austin City Council made the decision to delay the vote on Austin Energy’s proposed solar plant until March 5th. Council Member Mike Martinez wanted to put it off longer, but since the bid for the plant will actually expire just seven days after this March meeting, the council agreed unanimously to have the final vote in three weeks time. The foremost explanation for this delay was to give more time for the public participation process… though I think it is important to note that the “public” we’re referring to here is chiefly the city’s largest industrial rate-payers. The general Austin public has already shown its colors on this issue. According to recent surveys conducted by Austin Energy (and presented yesterday morning by Roger Duncan, general manager of the utility), Austinites want much more solar. At 30 MW, the proposed solar plant would be the largest utility-scale photovoltaic array in the nation, and the 6th biggest solar plant in the world. From where I’m sitting, that looks like just what the doctor ordered. Large-scale users are up in arms because, since they use so much more energy, they think they’re going to be particularly hard hit by any slight rate increase. Due to information that surfaced during this meeting, I am inclined not to feel terribly sorry for these folks. If you’ll just stick with me here, everything will be illuminated. I promise it’ll be good. The council had already decided to delay the vote before they even entered the chamber, but listened to presentations and public comment anyway. First on the agenda was Roger Duncan, general manager of Austin Energy.